Crate Trained: Yes, Oscar sleeps in his crate nightly with no problems. He also stays in his crate when we are not home. Physical Fence Required: No. He walks like a show dog on his leash. Additionally, he is a velcro dog. He does not want to leave his human’s side. Full Bio: Please meet Oscar! This super handsome guy is 8 years young, is white with brindle markings, and weighs about 67 pounds. 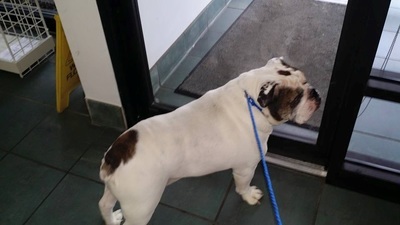 Oscar came to us as an owner surrender because his owner was moving, and the dog in the new home was aggressive with him. So he is now looking for his final furever home. 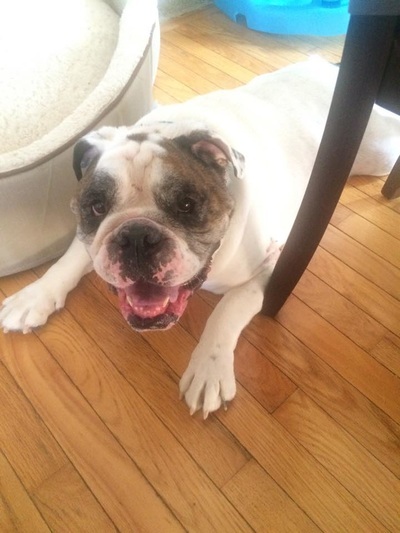 Oscar has been described as a “gentle giant” and constant companion. All he wants is to be with his humans and get lots and lots of love! 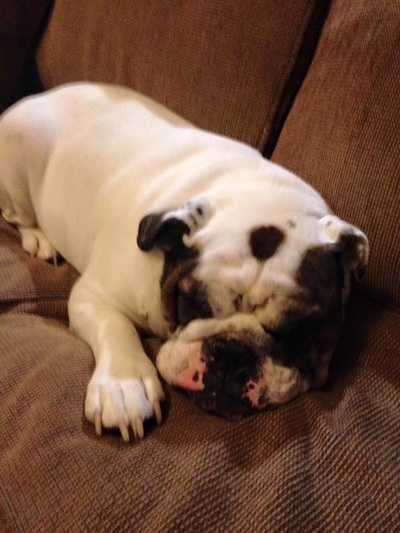 He is rather low maintenance, and loves napping – he is a pretty low energy bulldog. His perfect home is laid back, and hanging out on the couch. Oscar will need a home without other dogs – he is extremely dog selective, and although he has been able to get along with other dogs, it doesn’t last. He just wants to be the center of attention with his humans, so he gets pretty jealous. Oscar also does not do well with cats – so no kitties! He should also go to a home with older children due to his size and possibility of knocking down toddlers or young kids. Overall Oscar is a pretty healthy guy; he’s neutered and up to date on his shots. He does need his food moistened at feeding time. Oscar is house trained and crate trained; he goes into his crate nightly without any problems and also stays in his crate when his humans aren’t home. Oscar does not require a fence, and walks like a show dog on his leash…. He is like Velcro – he does not want to leave his human’s side. Oscar is looking for a place to rest his head. His favorite past time is napping and being by your side. He wants to go to a home without other pets so he can be the center of attention. Oscar doesn't require much and would rather sleep than go for long walks on the beach. July 15 update: Oscar the gentle giant—a constant companion. All he wants is to lie by his human’s side. 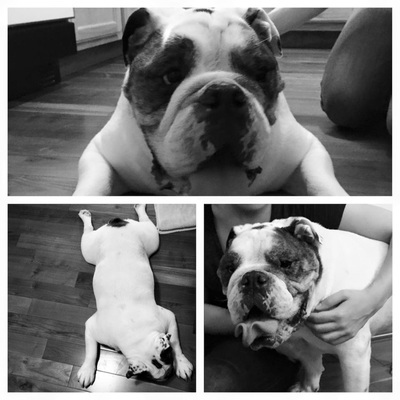 He is the most low maintenance bulldog we’ve had. 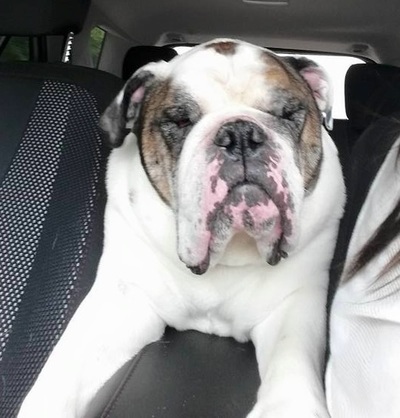 No long explanation is required for him: he is a wonderful old guy and he is ready to give and receive some lovin’s. Intake info: Please meet Oscar! He is an owner surrender due to moving and the other dog in the home being aggressive towards him. We will post more updates as we get to know him in his foster home.